From today's call...no injuries to report. Team heads to Athens, Ohio tomorrow at noon. No true freshmen will play on special teams. That's about all the news that came out of it. By the way, Vegas has 450-1 odds that UConn makes a BCS bowl this season. On to the first installment of the weekly picks. Feel free to post your own picks in the comments section. In the past, I've offered to give up the blog for a day to the winner of the season-long contest. No one has taken me up on that yet, but once again, it's there if anyone wants it. I feel good this season, though. I think this is my year. Game 1: Minnesota (-7) over SYRACUSE: This hasn't been as highly-publicized as Greg Paulus playing quarterback, but the Orange will also be suiting up Bobby Hurley at corner, Christian Laettner at tight end with Danny Ferry as the new defensive coordinator. On a side note, New Haven's own Garrett Brown is now a senior defensive tackle for Minnesota. Brown attended Fairfield Prep originally to play hockey. At 6-2, 310 pounds, the Gophers hockey team should suit him up after football season ends. He'd be hip-checking people through the boards and into the stands. Game 2: WAKE FOREST (-2.5) over Baylor: Ringo Starr returns for his senior season as Wake's quarterback. Baylor has an elite athlete at quarterback in Robert Griffin, but have you heard Ringo's vocals on Yellow Submarine? That's talent. Gotta go with the Demon Deacons. Game 3: OKLAHOMA STATE (-5) over Georgia: Mike Gundy banished media access to his team for 10 days, a span during which one player was arrested for driving with a suspended license and another was the target of a restraining order issued by a woman. He also decided to ignore the American Football Coaches Association's call for pregame handshakes this weekend to promote good sportsmanship because he's worried that might begin a brawl. Sounds like the man (have you heard? He's 40!) really has control of his players. 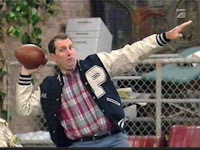 Game 4: Connecticut (-3.5) over OHIO: Ed O'Neill, the actor who played Al Bundy on "Married ... With Children" played football at Ohio. He never scored four touchdowns in a single game like the beleaguered shoe salesman, but he was a star outside linebacker who was signed by the Pittsburgh Steelers. I had no idea. "Married ... With Children" was a show I liked as a kid, but you don't fully appreciate until you're married...with children. Oh yeah, Huskies win easily. Game 5: ALABAMA (-6.5) over Virginia Tech: Nick Saban recently signed a contract extension through 2017, claiming he doesn't want any other job. Unless someone else drives a dump truck full of money to his door step, that is. As you can see, they're loving the Pear Bryant era in South Bend. Game 7: MICHIGAN (-13.5) over Western Michigan: Let's wrap up the week for Rich Rodriguez. A few of his own players go to the media behind his back to report possible NCAA violations regarding practice time, the topic all but brings him to tears at his press conference, he gets sued by a bank for failing to repay a loan for millions on a condo project, claims he was the victim of a Ponzi scheme possibly organized by a banned Clemson booster. Rich-Rod's next maneuver is to move to Massachusetts and run against Curt Schilling and his fake bloody sock for Ted Kennedy's seat in the U.S. Senate. Game 8: OHIO STATE (-22) over Navy: Since I have nothing to add to this...My first year in high school, the center for our JV basketball team, T.J., was 6-foot-4 but only weighed about 110 pounds. He had a tough time under the boards because he was so thin. To make up for what he lacked in strength, he decided to make it positively miserable for the poor sap guarding him that game. He refused to wash his uniform for the entire season. (By game 5, the dried sweat rendered his jersey stiffer than cement. He had to whack it against a row of lockers to loosen it enough to put it on). He also ate a healthy portion of garlic salt just before tip-off. His breath could have penetrated steel. That's thinking outside the box. Why am I telling you this? My fantasy football draft is Monday, and as usual, I've done no research. Taking a page from my old buddy T.J., my draft strategy is as follows. Step one: Bring a large, smelly cigar to the draft. Step two: Light up stogie around pick six of the first round. Step three: Refuse to extinguish cigar, no matter how incensed fellow owners become. Step four: Pray that the heavy smoke and pungent odor distracts fellow owners into making foolish picks. This can't fail. Hey, T.J. averaged a good 10 rebounds a game that season. I probably won't be invited back to the league, but I'll worry about that next season. Game 9: Cincinnati (+5) over RUTGERS: I honestly don't know what to expect from the teams in this Labor Day special. Hopefully, those stogies from my draft won't make me too sick to watch the game. Game 10: FLORIDA STATE (-6.5) over Miami: Bobby Bowden looks great. 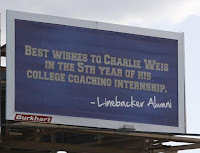 Did he lose a little weight, or is it just those 14 victories he had to shed due to academic fraud? Enter your picks by clicking the "comments" link below. There's a template in there to help make it easier. Don't forget about the live chat at 2. We'll do it every week, as long as there's someone there for me to chat with. I think Syracuse is going to beat Minnesota. Minnesota was a mirage last year (losing their last 5 games badly) and Syracuse has some decent players (ask Notre Dame). Perfect storm...I expect Greg Paulus to be all over ESPN next week. 2. Wake Forest. Although that QB at Baylor scares me. Look for him to ruin the huskies in a few weeks. 6. Notre Dame. I HATE picking them. 7. Michigan. I'm looking forward to seeing ND and Michigan - someone is going to lose their job after that one. 8. Ohio State. Poor Navy. 9. Rutgers. Rebound year for the Scarlet Knights, culminating with a trouncing of uconn on Halloween. Chip, are we picking using the spread? I can't remember what we did last year. I assume we are using the spread since you include it. Yes, we're using the spread.